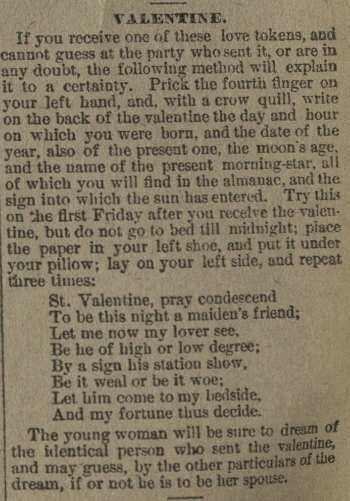 Dearest readers and friends, we long to see you on Valentine’s Day. Won’t you please set our hearts a-flutter and come to our Valentine’s Day open house? Do you fear that you will be too busy penning epistles of undying love to your own beloveds to join us? 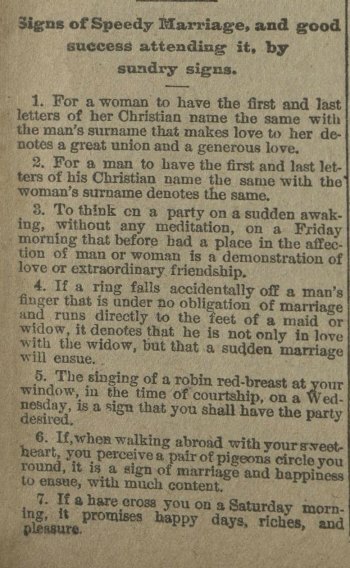 Ah, but this event is crafted especially for you: we’ll be sharing the most swoon-worthy of love declarations from the Rubenstein Library’s collections, so you may find just the term of endearment you need to woo your mate. Perhaps a few examples to help the time pass more swiftly until we meet? From the Odessa Massey Scrapbook, 1924-1928. 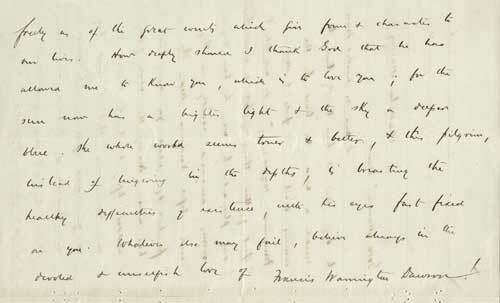 Letter from Francis Warrington Dawson to Sarah Morgan, February 10, 1873. 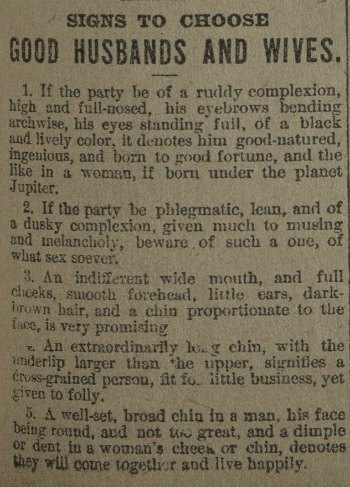 From the Francis Warrrington Dawson Family Papers. 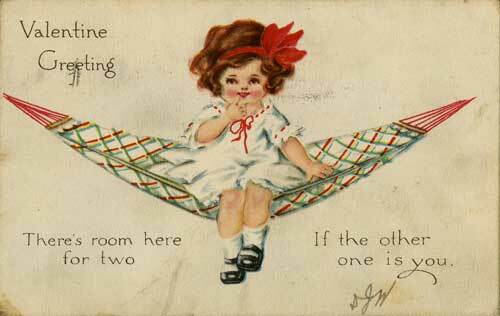 Valentine postcard, undated. From the Postcard Collection. And there might even be tips on how to present yourself when you present your valentine! Have we convinced you yet? What if we mention that there will be chocolate and candy? Did Valentine’s Day leave you with more questions than answers? Wondering who sent you that sweet Valentine? 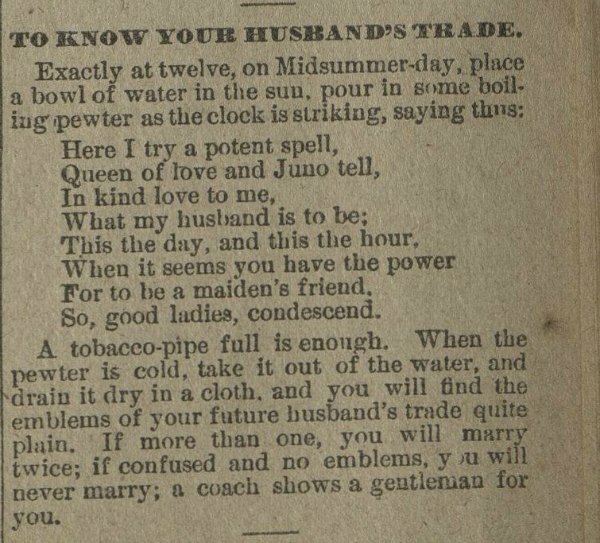 Want to know when you’ll meet your own Rapturous Codfish? 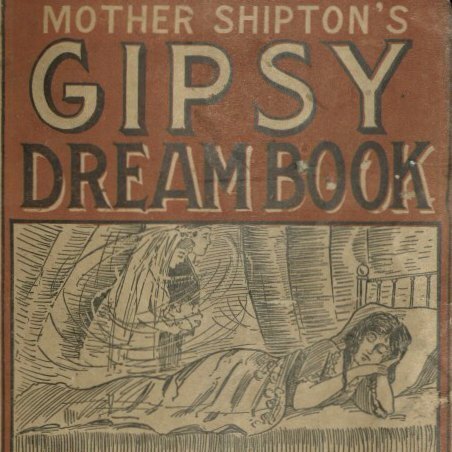 Perhaps Mother Shipton’s Gipsy Fortune Teller and Dream Book can be of help. 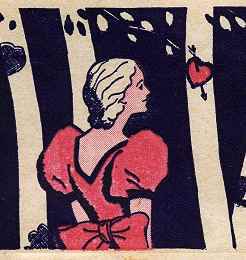 Happy Valentine’s Day, My Rapturous Codfish! 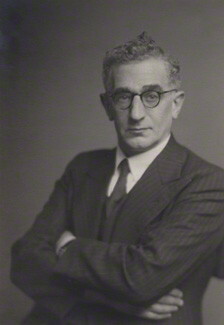 Image of Leon Simon, taken from London’s National Portrait Gallery. As my student assistant, Sophia Durand, began the physical processing of the 131 letters in the Leon Simon collection (1915-1916, 1918), she noticed something intriguing. Leon Simon addressed each letter to his future wife, Esther Ellen Umanski, differently. Until they made official plans to marry, she was “My Dear Nellie.” But once the date was set, Simon became creative and effusive, his word choices sometimes questionable as endearments. Romantics everywhere tend to be sugary in their pet phrases. Simon was no different, perhaps just more over-the-top. He addressed his letters to: My essence of honeycomb, My exquisite Peach Melba, My lump of sweetness, My peachiest apricot, My succulent meringue, My belovedest mimosa, My jujubious confection, My sweet Sugar plum(p). As you can already tell, Simon was quite fond of food and cooking. Other highlights in the letters include My stewed apricot, My eversweet parsnip, My most succulent kipper, My pickled herring (You know how I love them! ), My pickledest onion (=on’y ‘n =only one), My own dumpling, My coo (k) ing dove, My rapturous codfish, My toasted crumpet, and–my personal favorite–My incandescent soup-tureen. Occasionally, Simon sought to be reassuring about his odd turns of phrase. 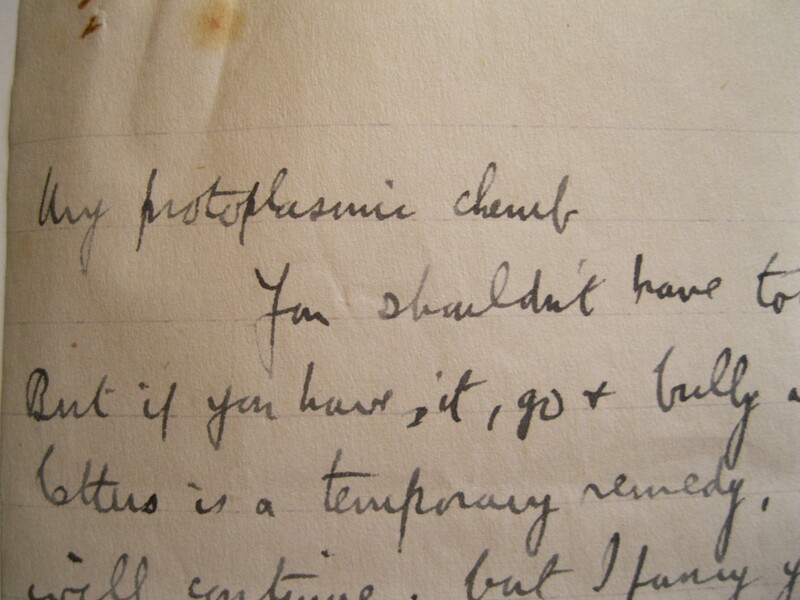 On October 20, 1915, he wrote to Nellie, who was studying German, “My most exquisite Stumpfenbach, (Don’t worry about the meaning of this; it is a term of endearment invented for the occasion & means nothing at all except that all recognized terms of endearment are hopelessly inadequate)…” A Duke German professor says that he was unwittingly referring to a city in Bavaria. 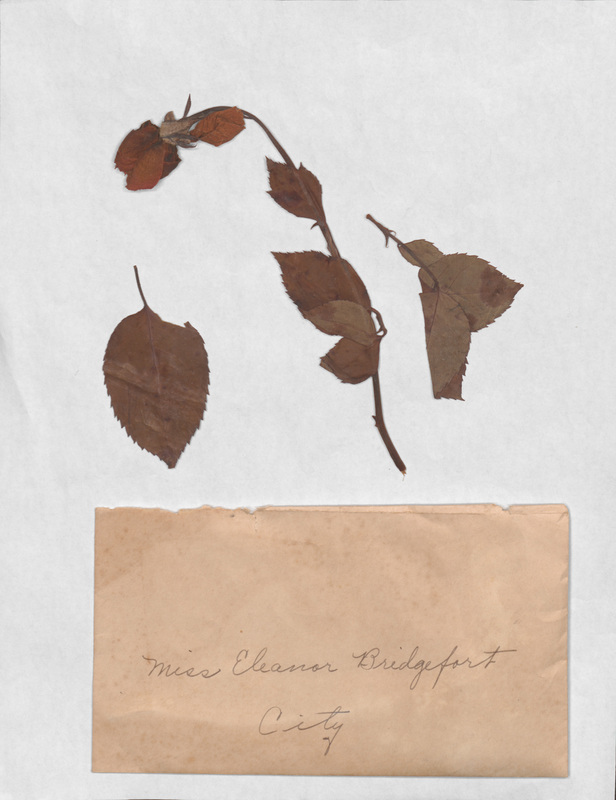 Post contributed by Alice Poffinberger, Original Cataloger. 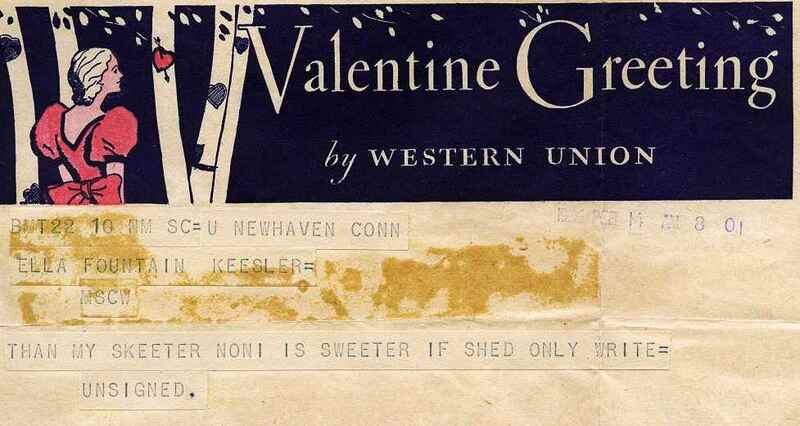 While this Valentine’s Day might result in many short love notes being traded via smartphones and Facebook walls, sweethearts sometimes used a different method in the early 20th century: the telegram. 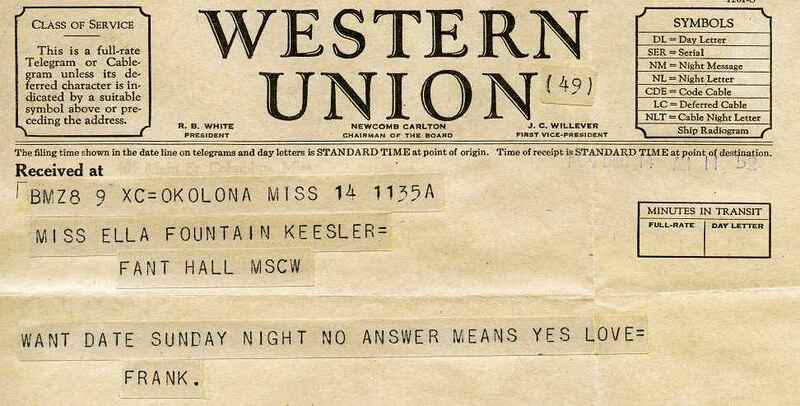 Ella Fountain Keesler Pratt, a Duke employee for almost thirty years (1956-1984), was the recipient of several sugar-coated missives delivered by Western Union in the 1930s. 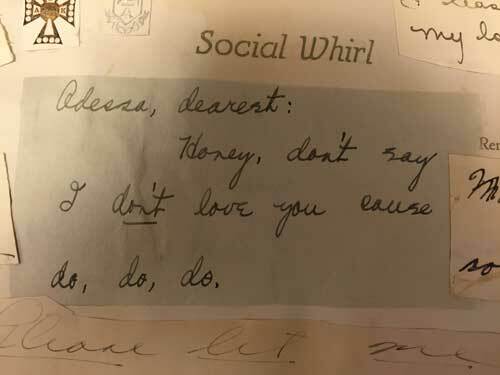 These are a few of the loveliest love letters, found while processing Ella’s papers. Duke begged, "Please give me a few dates ... Don't leave town if you do I'm coming after you." "Want date Sunday night No answer means Yes Love, Frank." 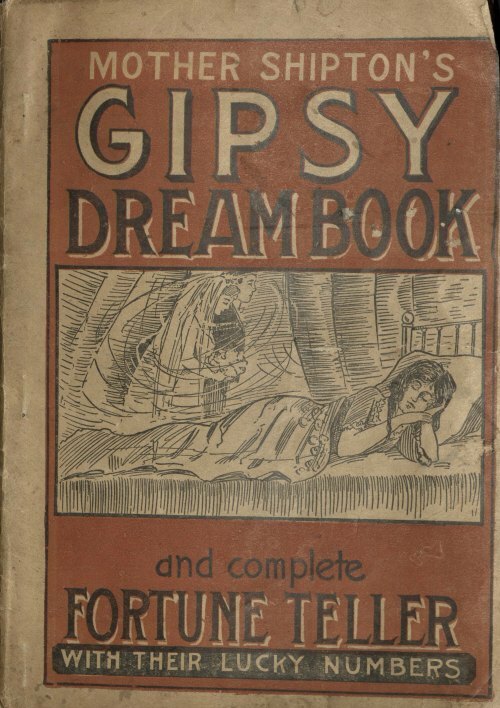 A secret admirer rhymed, "Than my skeeter none is sweeter if she'd only write." "Incidentally I Love You," signs Lanny. Ms. Pratt eventually married Lanier “Lanny” Pratt in 1938; he attended graduate classes and then taught at Duke University until his death in 1956. He must have said something right! Post contributed by Rosemary K. J. Davis, Drill Intern, University Archives. On April 17, 1909, Frederick Augustus Grant Cowper married Mary Octavine Thompson. Frederick became Professor of Romance Languages at Trinity College (now Duke University), while Mary (who earned a Ph.D. in Sociology at the University of Chicago) became a suffragette, helping to organize the North Carolina League of Women Voters in 1920. Both Frederick’s and Mary’s papers reside in the Rubenstein Library. 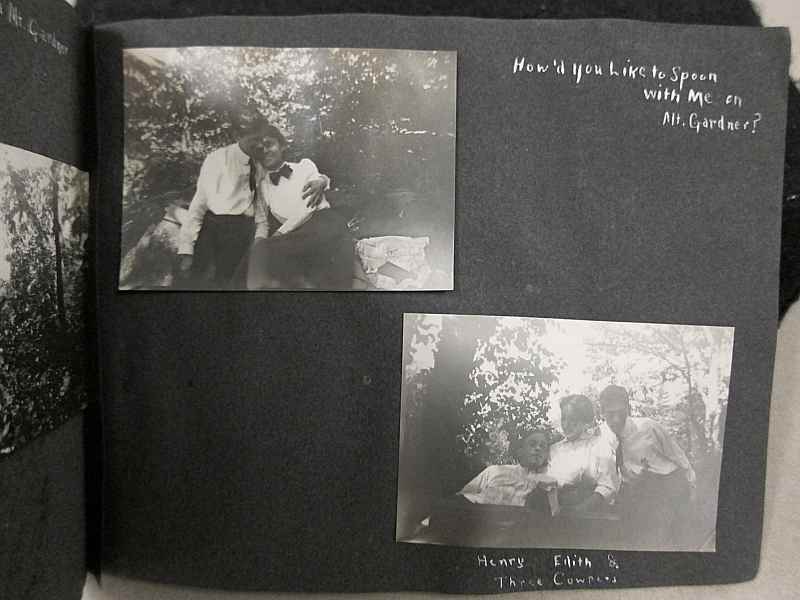 The Cowpers' honeymoon scrapbook, asking "How'd you like to spoon with me on Mt. Gardner?" Post contributed by Kim Sims, Technical Services Archivist for Duke University Archives.